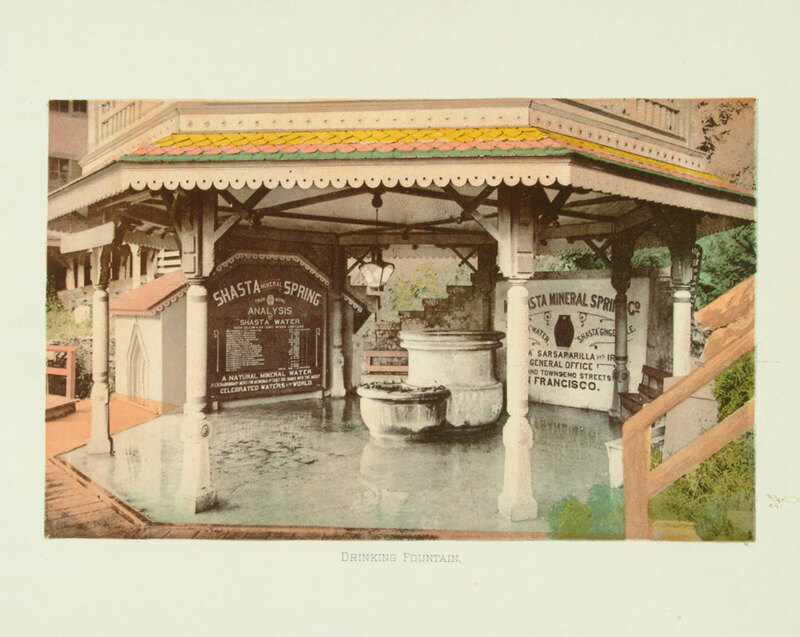 Dustin Naef explores the historic mystery of Mount Shasta, a mountain in the Siskiyou County of California best known for the dubious dwelling of Lemurians. Unpacking the provenance of such tales as he goes, Naef outlines the history of Shasta as per Native American sources – a regretful rarity for which we are indebted. Central to Mount Shasta’s Forgotten History & Legends is the reconsideration of North American history, according to those who originally made it. “It was said that the end came without warning. Once, long ago, as the people slept, the sun came out at night. It shot flaming arrow across the heavens which burst into thousands of fragments which fell to the earth. The people were startled out of their sleep by a rumbling and quaking of the earth. The skies above them were on fire. The waters of the lakes and oceans rose. Soon the waves became mountains of water that rose against the shores. The sun was blotted out and darkness covered the great green land and water. Terrified, the people ran to the hills to get away from the pounding water. For days the earth rumbled and quaked. Torrents of rain began coming down so fierce that water sprouted up out of the ground everywhere, overflowing the creeks and rivers. The people who knew where there was a cave high up on the mountain fled to it and saved themselves, all of those who stayed behind were drowned. It rained for a long, long time until all the valleys and low-lands became one churning sea, only the tops of the highest mountains remained uncovered, where the people stood huddled together listening to the wails below as countless bodies were tossed upon the angry waves, and then sank to their graves in the unknown depths. –Reminisces from Native American Flood Myths, recorded by Ella E. Clark (Indian Legends of the Pacific Northwest). Most people have heard about the fabled lost continents of Atlantis and Lemuria. For over a century, writers have been absorbed in following a puzzling trail of historical and archeological curiosities that suggest the existence of a high civilization that was wiped out in some kind of prehistoric cataclysm, and virtually erased from human memory. The opening passage sounds like one of the countless tales describing the alleged fall of Atlantis; but this is, in fact, a description of a cataclysm that devastated the Pacific Northwest during prehistoric times, and was recorded in the lore of northwestern Native Americans [E. Clark, 1953]. For as long as I can remember I’ve been fascinated by the visionary concepts of Atlantis and “lost civilizations,” going back to Graham Hancock’s book, Fingerprints of the Gods. When I began researching legends and historical mysteries in California and Mount Shasta over a decade ago, I didn’t have the faintest idea that the stunningly scenic place in which I was living is also one of the oldest and most mysterious places on the face of the planet. Every land has a story to tell, and mysteries to wonder about. Here in the western hemisphere there exists a vast, dark green volcanic wilderness of deep mystery and indescribable beauty, whose legends, history, and natural monuments stand out in their own right; this is a land which belongs uniquely to itself–it’s not necessary to evoke visions of Atlantis or Lemuria to define its grandeur, or try to mythologize it into something it never was. Situated in northern California at the beginning of a chain of towering, ice covered volcanoes, which collectively make up the backbone of the Cascade Range in the Pacific Northwest, Mount Shasta is where the story of a lost and forgotten continent began for me. 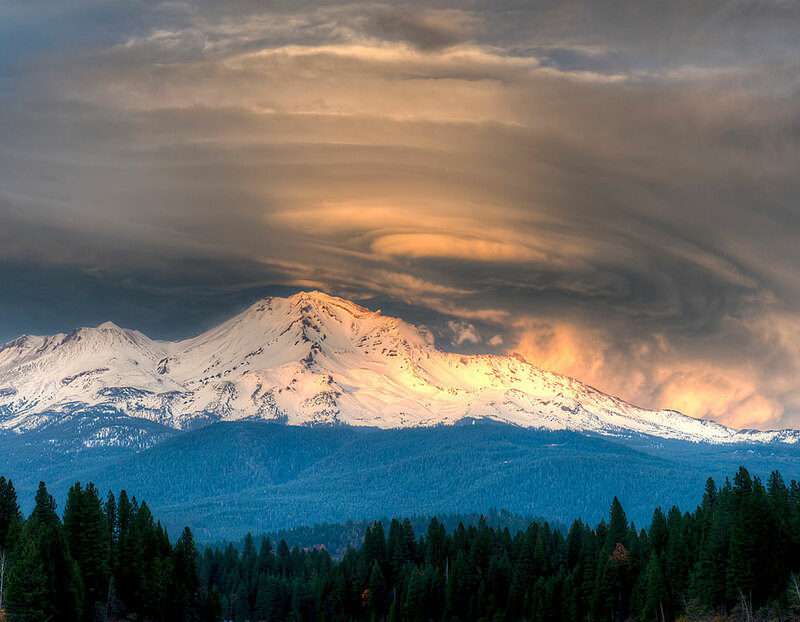 “Before the Storm,” Mount Shasta, California. Photograph ©Loree Johnson. Mount Shasta is well-known today as a sacred mountain. But much that is written about it in modern times has been written by people whose ancestors were never there. Many of the region’s prehistoric legends and traditions are largely unknown, and in some cases have to be found in obscure sources and historical books that are not easy to find, and also not readily available online, or in digital format. Much of the research I did for my book was done in the historical archives of libraries, which contain some of the earliest printed references to Mount Shasta’s legends. One of Mount Shasta’s creation-stories was recorded by Joaquin Miller in Life Among the Modocs (1873). Miller was a young a writer and poet who lived with a tribe in the Mount Shasta region from 1854 until 1857. One of the earliest published references to Mount Shasta’s creation-story, following Miller, comes from Ignatius Donnelly, who authored two books on the Atlantis hypothesis which became wildly popular with audiences in the late 1880s. Donnelly proposed that a comet impacted Earth in ancient times, and destroyed a high civilization that today is remembered only in myths. – Mount Shasta’s Creation Story, Joaquin Miller, (1873). – Mount Shasta’s Creation Story, Joaquin Miller (1873). Mount Shasta’s creation-story concludes with the daughter of the Great Spirit inter-marrying with one of the grizzly bear people, and from this union was created the modern race of humankind. When the Great Spirit discovers that the grizzlies have created a new race of beings with his child, he curses them and transforms them all into four-legged beasts. “Day’s End,” Mount Shasta, California. Photograph ©Loree Johnson. Donnelly believed that the ‘grizzly-bear people’ metaphorically represented a Neanderthal race, fur-clad in bear-skins, who evolved during the intense cold of the Glacial Age. There are a great number of supportive oral traditions found throughout the Pacific Northwest which describe a barbaric race of giants, who also dressed in animal skins, that were said to have perished in a Great Flood in prehistoric times. Some of these legends were recorded by Lucy Thompson, a Yurok culture expert, in To the American Indian: Reminiscences of a Yurok Woman (1916), and also Ella E. Clark, Indian Legends of the Pacific Northwest, during her travels and visits with Native Americans throughout Canada, Alaska, and the Pacific Northwest during the 1930s. It is difficult to find uniformity when looking at legends and oral traditions, because each different village and tribe developed distinct variations of their own; but many of them share enough details for it to remain plausible that they all originate from a common source of shared knowledge in the remote past. “Many of you already know that a great number of us are planning to eventually emerge to the surface when enough of you are ready and willing to receive us along with our teachings. It will be our pleasure to reconnect with all of you face-to-face and teach you all we know. We ask you to assist in spreading the awareness of our presence within Mount Shasta to all those whose consciousness is ready to receive this information. Do what you can to support our emergence to the ‘surface’, and it is my promise that you will never regret it. –Message channeled by Aurelia Louise Jones, from a Lemurian named Commander Adama, Head of the Lemurian Council of Light located in the City of Telos, Mount Shasta, Califonia. (Telos: Volume One: Revelations of the New Lemuria – Aurelia Louise Jones). In modern times, Mount Shasta is better known as a “New Age” mecca and entrance into the Hollow Earth, rather than a sacred mountain grounded in Native American cosmology and history. Some modern spiritualists claim that a secret crystal-city called “Telos” exists beneath Mount Shasta, where an estimated 1.5 million Inner-Earth beings live in a techno-spiritual paradise, shielded from the rudimentary technology of the surface world [A. L. Jones, 2002]. Telos is believed to be part of a vast, subterranean realm of underground civilizations that inhabit the Inner Earth. The crystal-city of Telos is alleged to have been built beneath Mount Shasta by an advanced race of super-human beings (originally from another galaxy) who call themselves the Lemurians, and lived on the Eden-like continent of Lemuria that was located somewhere in the Pacific Ocean. According to this story, after Lemuria sank to the bottom of the sea in a tremendous cataclysm, 25,000 refugees fled to Mount Shasta and built a domed city beneath it, using their mastery of energy, crystals, and sound vibrations to hollow it out. The Lemurians are frequently depicted as tall, blue-eyed, blond-haired beings dressed in white robes. It is claimed that caves on and around the mountain hide secret entrances which lead down into the Hollow Earth, through which the Lemurians pass freely when they wish to visit the surface-world. “Lemurian – Commander Adama of Telos” – Commander Adama Painting by artist Glenda Green. Image Source – Telos. Modern spiritualists who claim to be frequent visitors to Telos describe the Hollow Earth as a real place where nobody gets sick or grows old, replete with a civic government, its own religion, a subway transit system, dance clubs, hydroponic gardens, secret portals that lead to the surface (and also to other planets and galaxies), and virtually every other luxury imaginable; but it is a place which cannot be visited by ordinary human beings, unless you are spiritually evolved enough to be invited inside by the Lemurians [A. L. Jones, 2002]. Many of Mount Shasta’s modern “New Age” beliefs can be traced back to a book first published in 1906, called A Dweller On Two Planets, written by Frederick Spencer Oliver between 1886-1894, while he was a teenager living in Yreka, California. Oliver claimed to be a channel for a Lemurian spirit who called itself “Phylos the Thibetan,” who dictated to him a lengthy treatise about his past life journeys throughout Atlantis and ancient North America, via automatic-writing. Oliver’s book heavily influenced later authors and channelers who expanded on the concept of Lemurians living in a secret abode beneath Mount Shasta. A Dweller On Two Planets contains the first verifiable published references to a secret city hidden beneath Mount Shasta; the existence of a hidden entrance to the “Hollow Earth” located somewhere on the mountain; the concept of spiritual adepts guiding human affairs and living in the “Hollow Earth” beneath the mountain; Lemuria; descriptions of an advanced-technological civilization in Earth’s remote past, with flying aircrafts, holographic technology, ray guns, and free energy; and the channeling of disincarnate Lemurians to receive hidden knowledge about the past. 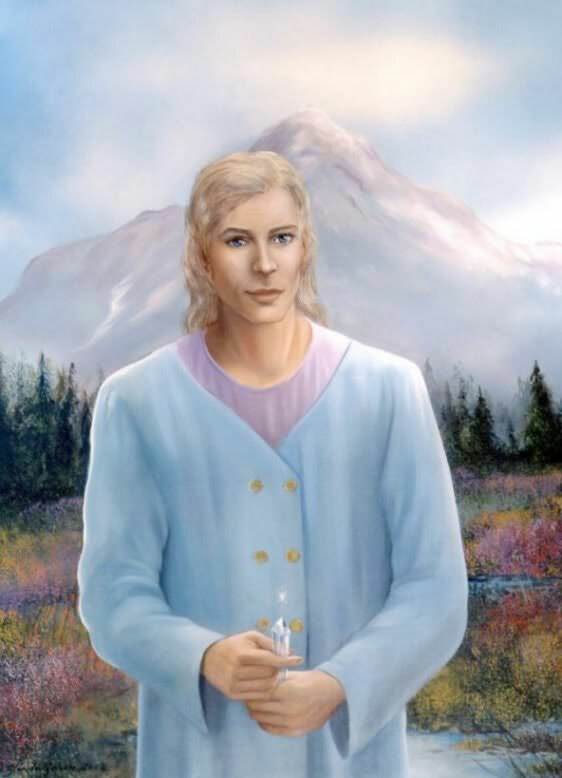 Oliver also appears to be the first person to state that one needed to have “special vision” in order to visit the subterranean realms beneath Mount Shasta, and talk to the spiritual masters who dwell there. In my own research, I failed to locate any prehistoric legends from Native-authored sources or historical material which describe a crystal-city in the Hollow Earth hidden beneath Mount Shasta, inhabited by beings resembling blond-haired and blue-eyed Lemurians [Naef, 2014]. These tales are unheard of in local Native American lore from prehistoric times, and did not appear in print until the late 1800s following California’s Gold Rush, after nearly all of the tribes who lived around Mount Shasta were massacred by early settlers and gold miners, as documented in Murder State: Calfornia’s Native American Genocide 1846-1873, by Brendan C. Lindsay. During the Gold Rush, the attempted genocide of Native Americans made it safe for entrepreneurs to move in and open up the lands for resource-extraction and commercial development. Ancient Native American sacred sites located around Mount Shasta were seized and developed for commercial tourism; elitist resorts such as “Shasta Springs” were built on the sites of sacred waters that were renown to possess healing properties; from the 1880s, the mountain’s pure waters were bottled and sold to upscale clientele around the world as a healing elixir, with advertisements touting the purity of “the Red Man’s medicine waters”. Shasta Springs is located along the Upper Sacramento River, south of Mount Shasta, in the traditional territory of the Winnemem Wintu [H. Hogue, 1948]. 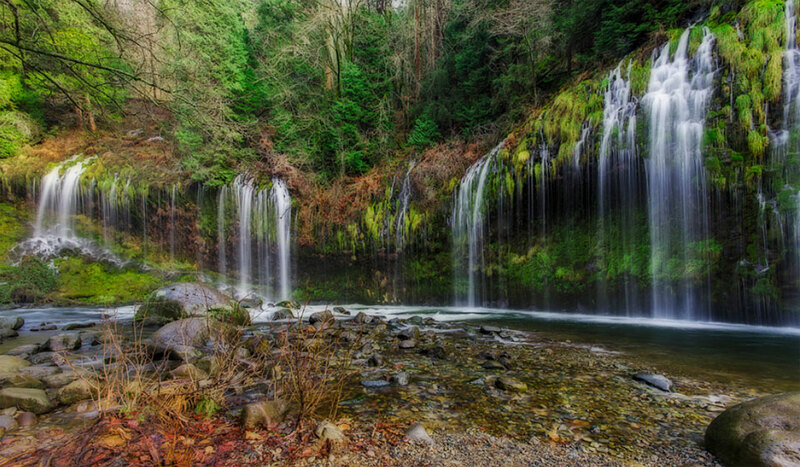 Mossbrae Falls, located on the river directly below Shasta Springs, was a Wintu sacred site where you would find good health if you bathed in the pool beneath the falls. The springs and falls were an abode of good spirits, where young people were taken by their elders to be educated in traditions [H. Hogue, 1948]. Today, the trail access to Shasta Springs and Mossbrae Falls is strictly forbidden to the public. 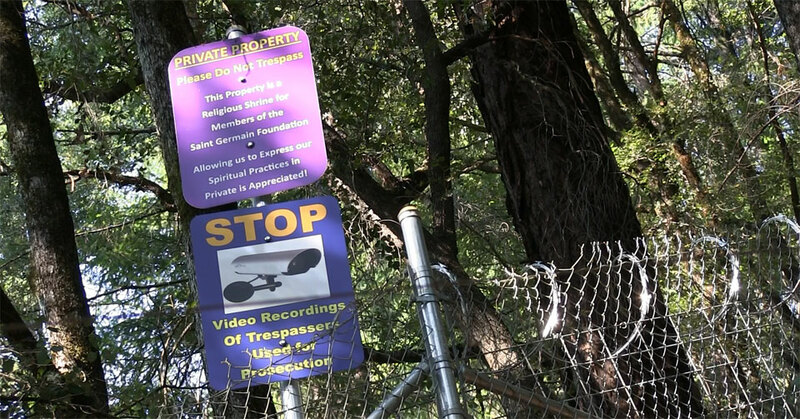 The Saint Germain Foundation owns the resort property, and they have surrounded it with chain-link fencing, security cameras, and razor wire. – Lama Anagarika Govinda (quoted from “Spiritual Pilgrims at Mount Shasta, California” – a study by Lynn Huntsinger and Maria Fernandez-Gimenez). Many Native Americans are understandably guarded about sharing specific details about their ancient traditions and pre-history with non-Indian people. One of the reasons given to me to explain this reluctance is because some people often take this information and distort it to fit their own theories [J. Nez, 2015]. The respected American-Indian historian, Vine Deloria Jr, estimates that only around ten percent of knowledge that tribal elders possess about North America’s pre-history is publicly known because of this bias. Sacred sites and traditions are generally not revealed or talked about unless they’re directly threatened, and action is necessary to protect them. Much of the Native American cosmology surrounding Mount Shasta was not discussed publicly until research studies by the Forest Service were conducted between the years 1980-1991 by ethnographers Nancy Evans and Dorthea Theodoratus, when the sanctity of the sacred mountain was threatened by a plan to build a ski resort and condominiums on top of it, perversely named “Lemuria Village”. Representatives and cultural experts from the Hupa, Karuk, Modoc, Pit River, Shasta, and Wintu tribes were consulted to provide information about Mount Shasta’s Native American cosmology, which has been inherited and passed down through generations of their ancestors. The full-text of the interviews has never been disclosed to the public, and some of it has been deleted to keep certain sites and knowledge about Mount Shasta secret [Evans-Theodoratus, 1991]. According to this study, tribal knowledge and ancient traditions surrounding Mount Shasta clearly define it as a sacred mountain within their environment, a place of origin-creation, healing, spiritual guidance, and also a place where significant historical events of past times occurred. Contrary to Mount Shasta’s modern perception as a “New Age” mecca, the mountain possesses a darker side to its legacy. Native Americans who have lived in its shadow have acknowledged the presence of an ominous force, and always respected, if not feared, the spirits and powers that have resided within it. Medicine men and women received their spiritual training at sites on and around the mountain, but it was not a place a person would ordinarily go, unless they had a very important spiritual reason to do so. Some tribes would not ascend Mount Shasta past the tree line on the upper slopes; that area was considered the dwelling-place of powerful spirits, and is held as a potentially dangerous place to visit. Any journey undertaken to approach the mountain’s upper slopes involved careful preparations through prayers, fasting, ceremonies, and guidance from a doctor or shaman. If an individual failed to heed these warnings and take the necessary precautions, the consequences could result in them being seriously injured, or even vanishing and never returning. Disrespectful behaviour on the mountain might be punished by the spirits, who would lead people astray, terrify them, or drive them crazy. 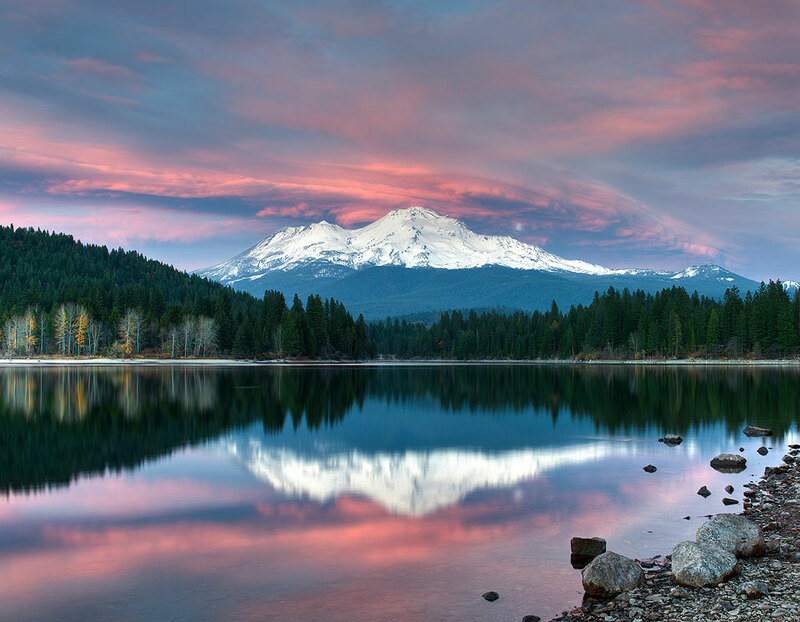 According to Wintu tradition, Mount Shasta has been the home of “little people” who reside within the mountain. The little people have always been around whenever ceremonies are held. They can be heard, and Native Americans have always known of their presence. My own understanding of the term “little people” does not indicate miniature-scale Leprechauns, but mysterious beings who are older, wiser, and smaller than humans, roughly the size of children. The legends of the Little People are ubiquitous throughout the western hemisphere of North America, and in addition to the Wintu, there are variations and descriptions of them found in the traditions of the Yurok, Pit River, and Karuk tribes (just to name a few) [L. Thompson, 1916]. Some traditions state that in ancient times the Little People lived in harmony with Native Americans, but then something happened and they vanished from pre-history [A. S. Clark, 2015], [L. Thompson, 1916]. It is a documented fact that many Native Americans still accept the reality of these mysterious beings, and their role in pre-history [A. S. Clarke, 2012]. I have devoted several chapters of my book to discussing the various legends surrounding them, which is too lengthy to be fairly treated and adequately covered here. In a 2008 study published by the National Park Service (Pacific West Region), ethnographer Douglas Deur stated that some northwestern tribes–in particular the Klamath and Modoc–traditionally view Mount Shasta as being structurally and energetically connected to a vast range of important surrounding landscapes; a primordial spiritual connection is believed to link all of these energetically powerful sites together, including Mount Shasta, Lassen Peak, Lava Beds, Medicine Lake Highlands, Crater Lake, as well as many other lesser landmarks found throughout the region. Mount Shasta is recognized as an important Native American cultural and cosmological property, eligible for listing in the National Register of Historic Places. Archeology conducted in Mount Shasta’s surrounding lands suggest at least 11,000 years of human habitation [Deur, 2008], designating the area around the mountain as one of the longest continually-occupied regions in North America. However, consultants referenced in the above-mentioned studies have agreed that historically it was not the practice of tribes to live on a sacred mountain, or any spiritual locale [Evans-Theodoratus, 1991]. Traditionally, sacred sites were kept clean and unaltered, in their pristine natural state. Therefore, no prehistoric evidence of human habitation has ever been found on Mount Shasta, and these ancient traditions negate the likelihood of any archeological materials of ever being discovered there in future. In Wintu traditions, Mount Shasta is viewed as a Creator-made temple or monument, and everything in nature was set in perfect balance and harmony. [Naef, 2014] The mountain is a holy place where healings, ceremonies and prayers are made more powerful, and is the home of sacred beings. If that balance is lost or disrupted, negative consequences can follow. Local tribes agree that any development or alteration of Mount Shasta could be dangerous for everyone who lives in the vicinity. The Wintu, Pit River, and Shasta groups are particularly distressed about possible future developments on Mount Shasta. There is concern that it would harm the energy of the mountain, and possibly dislocate the spirits who reside there. Some consultants believe that a “force” residing within Mount Shasta will intervene and destroy any attempts to alter it, because the mountain will find a way to react to its own desecration and return to its natural state [Evans-Theodoratus, 1991]. 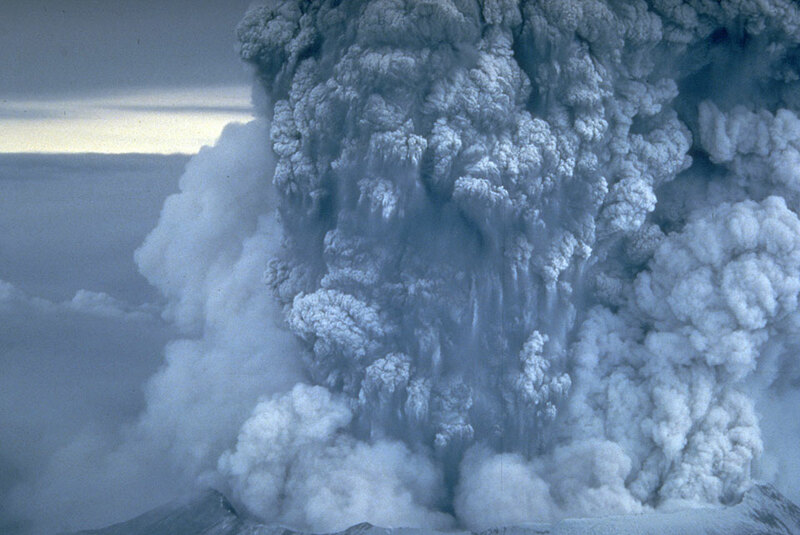 “Mount St. Helens Eruption 1980,” USGS Public Domain Photograph. Mount Shasta is situated at the southern range of a braid of towering, ice-covered furnaces that stretch for over a thousand miles northwards into British Columbia; the Cascade volcanoes are in fact “alive” in an abstract geological sense, capable of stirring and waking up at any moment. There is a force residing within them so powerful that their capacity to destroy–and create–challenges our comprehension. The eruption of Mt. St. Helens in 1980 exceeded scientists’ worst predictions by several magnitudes, and is considered to have been the most devastating volcanic eruption in the history of the United States [USDA Forest Service, 1980]. Mount Shasta is one of the largest stratovolcanoes in the world, rising up to an altitude of 14,179 feet [USGS.gov]; it is also part of a chain of Cascade volcanoes that encompass the Pacific Basin’s notorious “Ring of Fire,” along which the majority of the planet’s earthquakes and eruptions occur. According to the USGS, geologists and scientists consider Mount Shasta to be a very dangerous, high threat volcano which will erupt continuously far into the future, and it is also considered the one volcano in the Cascade Range most likely to produce an explosive future eruption of catastrophic volume [USGS: Volcano Hazards – Mt. Shasta], [D. Miller, 1980]. Ella E. Clark, Indian Legends of the Pacific Northwest, (1953). Joaquin Miller, Life Amongst the Modocs Unwritten History, (1873). Inatius Donnelly, The Destruction of Atlantis: Ragnarok – the Age of Fire and Gravel, (1883). Lucy Thompson, To the American Indian: Reminisces of a Yurok Woman, (1916). Aurelia Louise Jones. Telos – Volume One: The New Revelations of Lemuria (2002). Dustin Naef (library research on the pre-history of Mt. Shasta) – and also: filmed video interview with Chief Caleen Sisk, Winemem Wintu Chief and Spiritual Leader, (2014). Brenden C. Lindsey, Murder State: Calfornia’s Native American Genocide 1846-1873 (2012). Picturesque Shasta Springs on the Shasta Route of the Southern Pacific Co. between San Francisco and Portland. (1895). Helen Hogue, Wintu Trails, Shasta Historical Society (1977) – originally published as “Peaceful Now The Trails” (1948). “Spiritual Pilgrims at Mount Shasta, California – a study by Lynn Huntsinger and Maria Fernandez-Gimenez. Dustin Naef: filmed video interview with Jason Nez, Navajo Archeologist, Breaking Sacred Ground: The Confluence (2015). Vine Deloria Jr., Red Earth, White Lies: Native Americans and the Myth of Scientific Fact (1997). Lucy Thompson – To the American Indian: Reminisces of a Yurok Woman (1916). Ardy Sixkiller Clarke, Encounters with Star People: Untold Stories of American Indians, (2012). 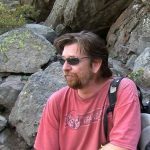 Douglas Deur, In the Footprints of Gmukamps: A Traditional Study of Crater Lake National Park and Lava Beds National Monument, National Park Service: Pacific West Region (2008). 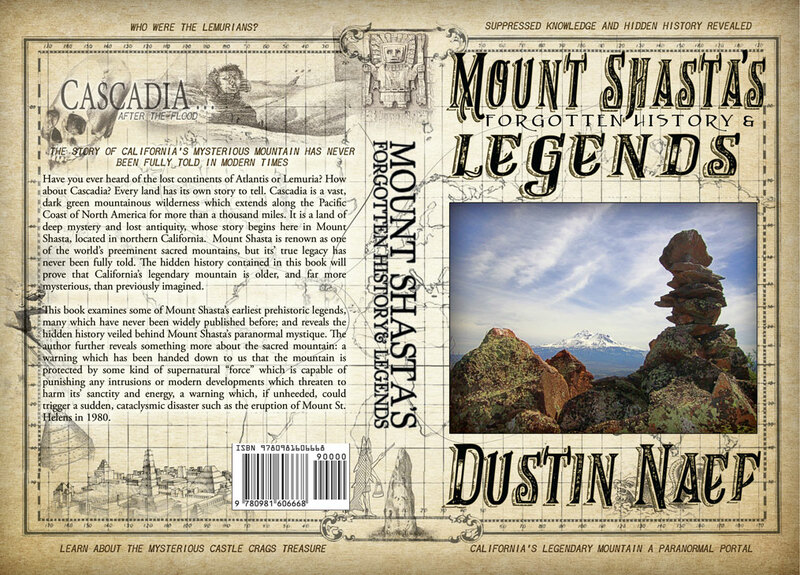 DUSTIN NAEF is the author of two books: Mount Shasta’s Forgotten History and Legends (2016), and Mount Shasta’s Mysteries (2017). Dustin became interested in Mount Shasta’s legends and prehistoric history after exploring the area for over a decade. Years of research led him to conclude that the mountain’s true history has been largely omitted, and never fully told before in modern times. The modern spiritualists views about Mount Shasta are well known and documented in countless books, however very few people are aware of the ancient legends and history of the sacred mountain. It is the author’s view that prehistoric Native American legends preserve accurate memories of historical events that have occurred here in the remote past. Dustin’s primary fields of interest are history, the occult, mysterious legends, the paranormal, mythology, and folklore. There is another title called: Mysteries and Legends of Northern California: The Truth About Mt. Shasta and Beyond by Bradbury Cort Lindahl. Is it tackling other criteria than the ones being handled here? Any idea of Lindahl’s link to this thesis? I’m only vaguely familiar with Cort’s research and not read his books, my understanding is it has something to do with ancient royal families manipulating religious and spiritual beliefs, and building monuments around the world which align to some kind of grid. I’m not sure how Mount Shasta fits into it. He has a number of videos about it on YouTube if you want to learn more about it. I believe I have lived in Lemuria at some distant past. If a Lemurian has information for me I am open to receiving it. Really great article, glad that the author totally avoided the usual pitfalls of New Age romanticism in order to give a full history that includes the indigenous perspectives of Mt. Shasta, both good and bad. For me the deepest irony of this piece is the contrast drawn between the ‘lemurian’ new agers who claim that anyone looking at Mt. Shasta feels drawn to revere and worship it, and the tale of early U.S. gold diggers massacring native peoples around the area to get rich. Both statements cannot be true and history shows that enlightenment does not come to those who simply happen to visit the right vacation spot or buy the right crystals. The native peoples were very clearly right to fear the dark side of this beautiful locale. One last thought: the tales of enlightened beautiful people living hidden from view, enchanting those who approach them the wrong way and even abducting humans, all strike me as fairy like / alien like tales. John Keel would have had a field day with Mt. Shasta lore! A very interesting article. It’s often useful for such lengthy articles to understand the reasoning behind the discussion. Agree with Elain’s comments – especially her appreciation of the author’s even keeled (pun? )rendition of this magnificent mountain’s ancient indigenous history. Would probably prefer the Lemuria obsession though (at least it is sealed away under the mountain and only by invitation)over the dangerous development plans.